When describing someone as capable of doing or determined to do something, a preposition is required between the adjective and verb. 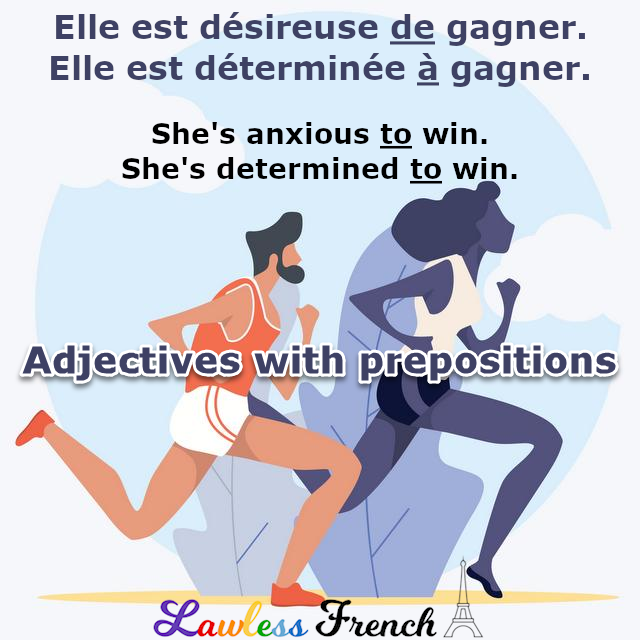 In French, the choice of preposition depends on the adjective that precedes it, not the verb that follows. This lesson is specifically about adjectives with the personal verb être. Prepositions after impersonal expressions like il est impossible have their own rules which will be addressed in a separate lesson. Adjectives related to some kind of ability, attitude, or imminent action are generally followed by à plus an infinitive or noun. Note that in English, the preposition is "of" or "at" when it’s followed by the gerund (doing) and "to" when it’s followed by the infinitive (do). Adjectives related to feelings, states of mind, and obligation are usually followed by de plus a noun or infinitive. * I know, this indicates ability but takes de. What can I say? French likes to keep us on our toes. Tu es assez studieux pour aller à l’université. You’re studious enough to go to college. Il fait trop beau pour travailler. The weather is too nice to work. Nice one–this is really difficult information to find! How about “easy to” and “difficult to”?